Our Stew pans possess the curved profile and low sides that are essential for creating thick reductions, stews and sauce-based recipes while retaining maximum moisture, texture and intense flavour. The 20cm stew pan, the smallest of our stew pan range, is constructed of Falk 2.5mm bimetal copper for outstanding heat conductivity. Versatile, durable beauty and performance from the hob to the oven. Falk Culinair, helping you achieve your culinary dreams. 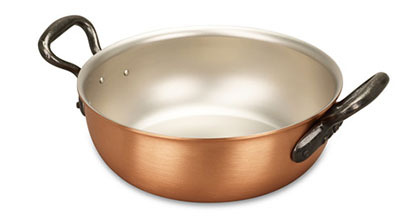 Our service department is as responsive to our customers as our solid copper cookware is to temperature. Nothing but the highest quality materials, most versatile products and the most dedicated customer service will do. Falk Culinair. We define excellence. We've just bought this along with the 20cm Rondeau and the 25x17 Gratin to complement all of the other items we've had the pleasure of buying from this excellent company and at risk of appearing repetitive, they are just brilliant in every respect, as is the level of service and customer connection. We can't recommend this company and their products highly enough and although initially expense might be a bit of an issue, over time they will out last and out perform anything else out there and become heirlooms to fight over so best adjust those wills folks ! 536 customers found this review helpful. Did you? Yes, I did! A versatile piece, great for scrambled eggs and custard on the hob or just about anything in the oven. Perfect for oven cooked vegetables. 666 customers found this review helpful. Did you? Yes, I did!